The report analyzes trends in the region and how they affect freedom of expression, pluralism and media independence, as well as the safety of journalists. Regional Overview from UNESCO. (Sreenshot). Increase in internet access is precisely the “the most significant and pervasive trend” found by the study that analyzed the 33 countries that make up the region. According to this study, between the years 2013 to 2017, the increase in internet users was 17 percent. Also, according to a study cited by the UNESCO report, it is projected that the increase in internet access through mobile devices will be 50 percent by 2020. The report, however, points out that there is still a great disparity in the region based on the economic status of the inhabitants or the area of residence, whether it is rural or urban. There is also a big difference between broadband speed compared to developed countries. In this sense, the report points out that one of the “most pressing needs” in the region is to improve the quality of internet service. The increase in internet access has forced traditional media to move part of their content to digital platforms. However, television is still the main medium through which residents receive their news, which makes it a medium that “can shape the public opinion,” an important aspect especially in electoral times, the report adds. In this sense, the process of digitization of television could become a mechanism that allows greater access to new operators and thus encourages pluralism. However, the report said that not all States are taking advantage of this situation. 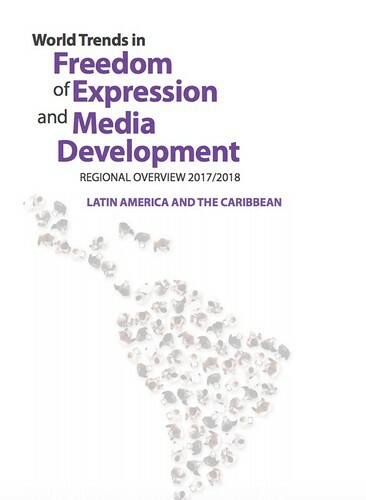 In Latin America and the Caribbean there are legal frameworks that seek to protect and guarantee freedom of expression, according to the report. However, due to social contexts that do not coincide with these regulatory frameworks, it is difficult to implement them correctly. For example, according to the report, it is increasingly common for officials to try to regulate content on the internet through the criminalization of so-called "hate speech" that may affect the reputation or good name of a person. Defamation laws continue to be used to jail social network users or journalists for online publications. Also, intellectual property laws – copyright – are used to remove content from the internet, in some cases considered censorship, according to the report. The report found that the number of orders from governments to Twitter and Facebook to remove content began to increase since 2013. In 2016, for example, 165 orders were made, while Google received 1,751 requests for content removal that same year. On the other hand, States have supported laws that allow access to public information. However, in the Caribbean, only five of the 14 countries have freedom of information laws. And in the countries that have them, authorities usually put obstacles in the way of accessing that information, the report said. The safety of journalists continues to be one of the greatest concerns in the region. Insecurity and self-censorship have increased since 2012 “due to an escalation of violence against journalists, legal harassment, and the increasingly hostile treatment of the private and independent media by the political leadership in some countries,” according to the report. Between 2012 and 2017, 125 journalists were killed in the region, which places it second in the world. Ten percent of them worked online, which according to the report is a new trend if one takes into account that in the past five years no journalist from this kind of media has been killed. These figures are accompanied by high rates of impunity. Although there have been convictions for these crimes, only 11 percent of the cases have been resolved, according to the report. Women journalists suffer sexual harassment from their colleagues, receive threats or are harassed for their work, the report said. However, a trend that has increased is online harassment, which has grown since 2012. These attacks include smear campaigns on the internet, usually with sexual references, threats of sexual violence and death threats, which lead to self-censorship. The region has become a leader in mechanisms to promote the protection of journalists. Colombia has the oldest mechanism in the region, which was created in 2000. This was followed by Mexico in 2012, while countries such as Honduras, Paraguay and Guatemala have shown their intention to create one, the report added. Member States have also participated in a training program for judges and judicial operators, led by UNESCO, on the legal framework for freedom of expression, protection of journalists and access to public information. The Special Rapporteurship for Freedom of Expression of the IACHR has co-organized these courses online since 2014 with the support of the Knight Center for Journalism in the Americas. The report on Latin America and the Caribbean is part of a global report published by UNESCO for the third time. In it, freedom of the press is analyzed through four dimensions: freedom, pluralism, independence of the media and security of journalists. The objective is to be able to apply its findings in the 2030 Agenda of the United Nations for Sustainable Development that “recognizes the importance of ensuring public access to information and protecting fundamental freedoms,” as written by Audrey Azoulay, director general of UNESCO, in the report’s executive summary. To view the complete report on Latin America and the Caribbean, click here.